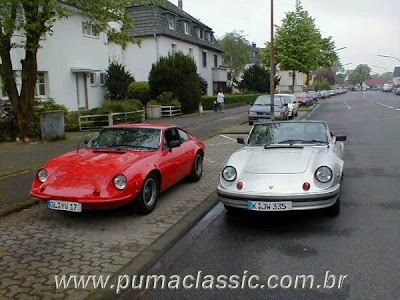 São veículos existentes na Alemanha, que passeiam e formam o Puma Club Germany. 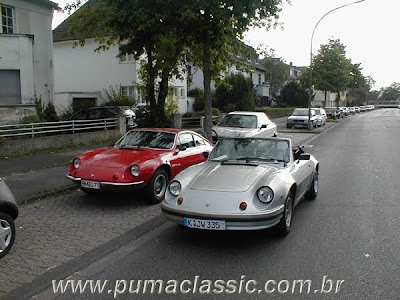 Só para ficar registrado, o Puma conversível não é nada original, nem como GTC, simplesmente foi modificado ao gosto do proprietário. 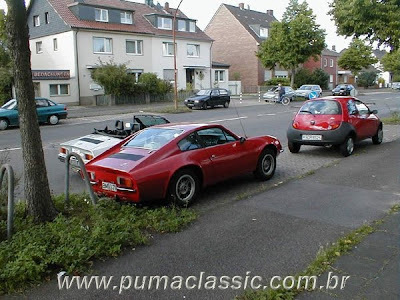 Hello Felipe the two cars belong to one family which owns three Pumas. The father owns the red GTE Coupe with a hot modified Type 4 Motor with drysump lubrication, one son owns the pictured silver convertible and the other son another red GTE Coupe. 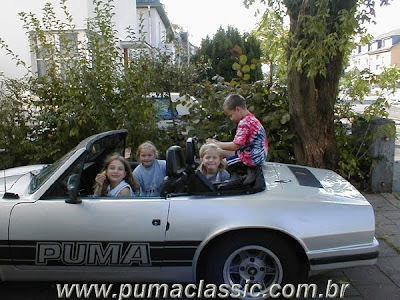 The Convertible is not modified they where sold like this here in Germany in the beginning of the 1980´s by the Importer GLASFLUEGEL. We know of two more convertibles with these Bumpers and one Coupe. Also there are two more advanced design versions of this frontbumper using Porsche 924 turn signal indicators. I will sent you some pics of the cars and a scan of the Brochure in the next few days. Um dos filhos tem o conversível prata da foto; e o outro é dono do Coupé GTE vermelho. O conversível não foi modificado, já foi comprado assim do importador Glausfluegel na Alemanha no começo da década de 80. Conhecemos outros dois conversíveis com esse para-choque e um Coupé. Há também outros dois com versões mais modernas de design desse para-choque dianteiro usando as lanternas de seta do Porsche 924." 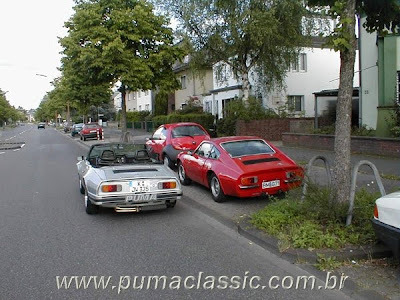 Bern, I had never seen this modification made by an assembler in the old model of Puma. That's interesting. It might has been done exclusively by this importer. 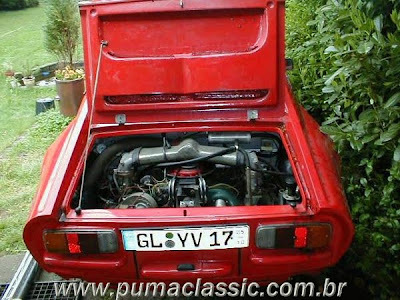 Bern, eu nunca tinha visto essa modificação feita pela montadora no modelo antigo do Puma. É interssante. Talvez tenha sido feita exclusivamente por essa importadora. Heitor thank you for translating. Felipe You are correct, the modifications where made after Importing the Cars to Europe but before delivering them to the Customer. A friend of mine owns one of the original Glasfluegel Molds for the Porsche 924 Lights Front Bumper Version. 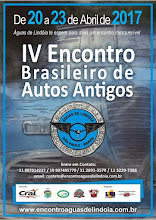 Este motor Type 4 é o utilizado nos porsches? Quantos cv tem em média? Qual o tipo de carburação? eE o sistema dry-sump é o nosso carter seco?